Three years ago today, my husband and I tied the knot. 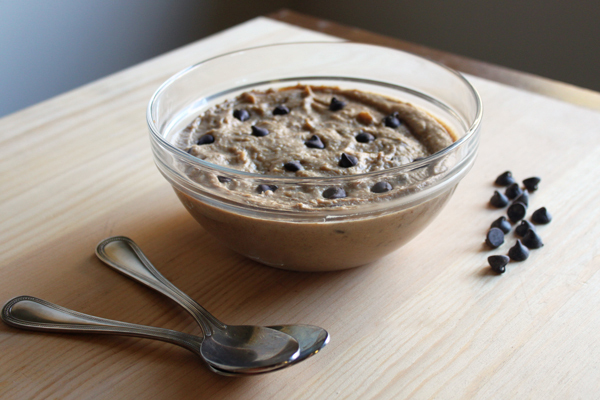 The night we met, I was (cringe) inhaling a tub of chocolate chip cookie dough. Not a tube, a tub. In what appeared to be a rare moment of dessert generosity, I gave some guy the last bite, but it was only so that no one could say I ate the entire thing by myself. We've been sharing desserts ever since. In honor of that sweet night, we had to have a cookie dough wedding cake. Now, this was back when people pinned things to actual corkboards, so it was impossible to find pictures of my dough-filled dream cake online. It even took months to find a baker who would agree to make something so untraditional. In the end, we had a beautiful cookie dough cake and ate it, too. 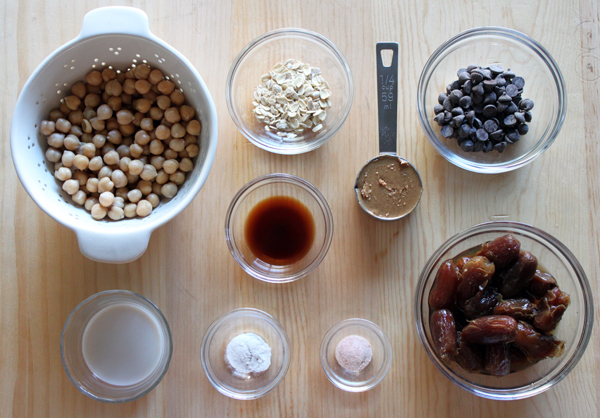 Today, it’s easy to find creative takes on cookie dough (thanks, Pinterest! 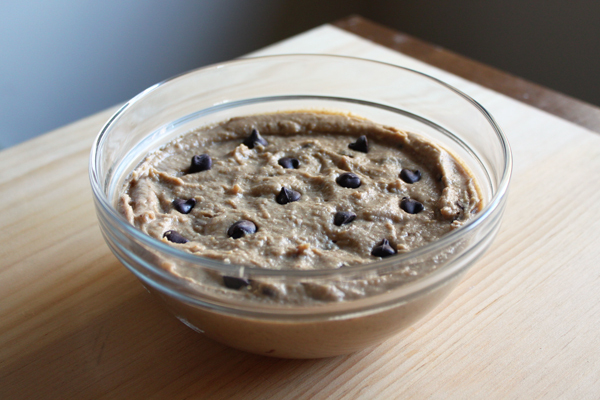 ), including healthier versions, like this sugar-free cookie dough dip that I’ve been waiting to make for our anniversary. I did a test run over the weekend and this time, let my husband have more than one bite. To make the recipe, I used chickpeas, soaked dates, raw almond butter, vanilla almond milk, vanilla extract, baking soda, and salt. I whipped up everything in a food processor, then stirred in dark chocolate chips. Now, I'm not going to say it tastes just like that tub of Toll House, but it’s close enough to satisfy my cookie dough cravings without the extra junk. We’ll definitely be having more spoonfuls tonight while reminiscing about our big day—and the night that started it all. Just for fun, here’s the moment right after we cut our cookie dough cake. You weren't kidding! Loved seeing your pics of the finished product on Instagram! Happy Anniversary! You two have such an adorable story and those are wonderful pictures, Julia! (In Cookie Monster's voice) Me want cookie now! Thanks, Bethann! Me want to hear your Cookie Monster voice in person! Aw. I miss you kids! Hey, Anthony! That reminds me--we met you exactly a year ago en route to celebrate anniversary number two! Hope you are doing great! Awww, that's such a cute story and funny story of how you guys met. You can't go wrong bonding over a tub of cookie dough : ) That's really special that your wedding cake was cookie dough. 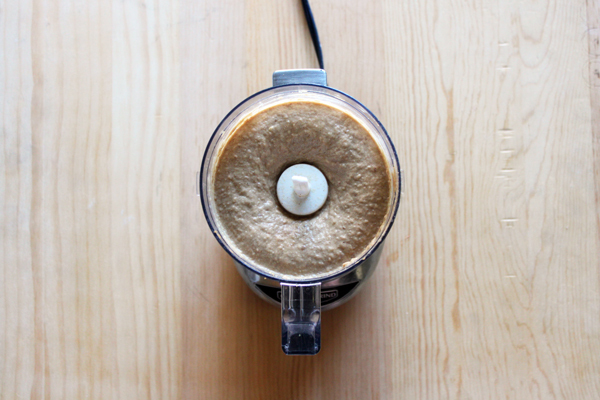 Adding chickpeas sounds so interesting! I'm curious what kind of taste/texture it would add. I might have to try this out this weekend!